Yesterday afternoon I had a break in the schedule so I went out for a neighborhood bike ride. I kept it to about 30 minutes. The first three minutes had some stops and starts due to equipment issues that I needed to resolve on the fly. A half hour provided enough time for me to feel like I'd done some work. Still, it was easy enough that I didn't need to disrupt our evening plans with another shower. This morning I headed over to Bethpage to do my long weekend run. I haven't done much more than five miles on any run since the half marathon. Even though my knee is still tender it's ready for more distance. I targeted 6-7 miles for this morning and ended up running 6.6. When I arrived at the park the parking lot was 3/4 filled and I noticed a lot of bikers gathered near a table set up near the bike path starting point. 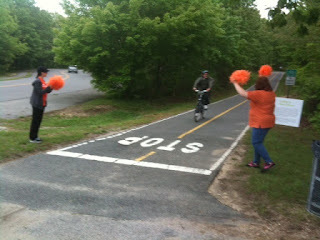 I learned later that the were holding an event called Bike MS: Traffic Free Family Fun Ride. I knew then that I'd have plenty of company on the trail and I worried a bit about inexperienced cyclists who didn't understand how to share the road with runners. With one exception, a serious looking cyclist who came up behind me and passed to my left with barely a foot of clearance, the other bikers were extremely courteous. 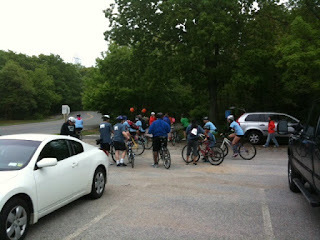 Most experienced cyclists provided the requisite and helpful "On your left" as they approached. I had a PowerBar Strawberry Banana gel prior to my run and I carried my Amphipod hand bottle filled with G2. Both provided good energy. I ran at an easy pace and was able to manage the frequent hills without much trouble. Near the end of my run I was passed by a young woman who was moving so well that she soon passed me again, going the other way. I wasn't trying to break any speed records but she was probably running double my speed at that point. Once I crested the dreaded last hill I was ready to call it a run. I was happy to note that my knee held up well till the end. As I made my way to the final downhill that leads to the start of the path I saw the two "cheerleaders" who were waving their pom poms to celebrate every charity biker who finished. The high school aged cheerleader even gave me my own rah! rah! finish that I appreciated. It was a nice event for an important cause and they had a great turnout. Later in the day we went over to the REI that (finally!) opened on Long Island. I felt like a kid in a candy store and I could have spent the entire day there. We got our daughter a mountain bike and I also picked up some gels and Brooks running shirt that was on sale at a great price. It's been a busy and active weekend. Since noon on Friday I've done almost 14 miles running and another 5.8 biking. I'm looking forward to my weekly rest day tomorrow.